Warming spice mixture for stoking agni/digestive fire. Good to use for stir-frys, grains, soups, greens, kitchari… In a jar put equal amounts of: Fennel seeds, cumin seeds and mustard seeds. Add a spoonful of seeds into the warming oil or ghee in your pan. Let simmer until you hear seeds start to pop. Then add onions and salt and turn down fire to create a sweat. Add any other vegetables, grains and beans your recipe calls for. Kitchari is a mixture of a grain and smaller beans. 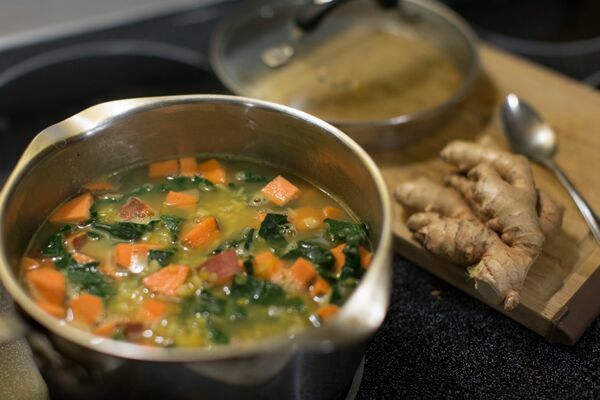 It is the main meal eaten during a seasonal ayurvedic cleanse. Different spices can be used to create a meal that is balancing to vata, pita or kapha. When seeds pop add onion and salt. Turn fire to low and cover until onions translucent. In the meantime rinse your grain and beans 3 - 5 times so water runs clear. Throw sweet potatoes and cauliflower into pot. Pour in rice and water. Add a pinch of hing. You can add more water to make it more soupy if you prefer. Turn up fire so mixture boils. When it boils turn it down to actively simmer. In 25 – 35 minutes add frozen peas and stir gently. Turn off fire and let sit to steam for 10 minutes or longer. Enjoy with added ghee on top, avocado, sesame seeds and nutritional yeast. You may also like to squeeze some lemon or garnish with parsley.